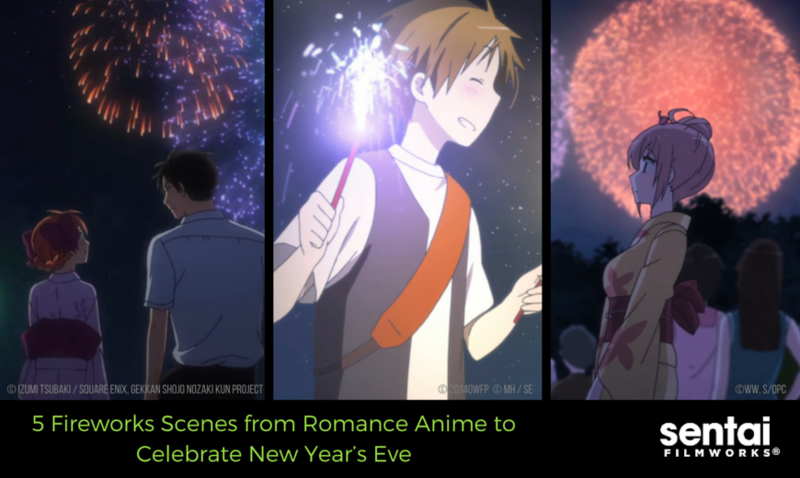 Nothing says “New Year’s Eve” like fireworks, and nothing says fireworks like romance anime! Whether you’re ringing in the start of 2016, or the beginning of an exciting new relationship, these beautiful fireworks scenes are sure to suit the mood perfectly. This quietly beautiful slice of life show starts with a bang! It’s the night of the summer festival, and all of the main characters are heading out to the festivities. The cast is introduced one-by-one in a montage, and once we reach Toko, our protagonist, the fireworks begin. Sorata, Shiina, and their friends are on the run from a school security guard after sneaking into the pool without permission. They make it over the front gate, and are greeted by the sudden sparkle of fireworks overhead. Shiina takes a running jump into the air, and Sorata watches in awe as she is silhouetted against the dazzling display. Not all of our favorite scenes involve bombastic displays! One Week Friends’ fireworks scene finds Kaori and Yuki at the beach with their friends. After a day of playing at the arcade and walking around on the beach, the group breaks out sparklers and small fireworks to enjoy among themselves. A particularly tender moment sees Kaori lighting her sparkler off of Yuki’s. Emotionally stilted Hachiman finds himself at the summer festival with bubbly, outgoing Yui. While Hachiman tries to play it cool, Yui’s blossoming affection for him is evident as they walk past the myriad food and game stands. Just as the episode hits its midpoint, the two look up as fireworks begin to illuminate the sky. Poor Chiyo spends the entirety of Monthly Girls’ Nozaki-kun attempting (and horribly failing) to express her feelings to the oblivious Nozaki-kun. In the final episode, the two are watching the summer fireworks on top of a jungle gym, when Chiyo finally manages to squeak out a quiet, “love you.” While it is the setup for humorous misunderstanding, it doesn’t detract anything from the romance or sweetness of the scene. Wakaba * Girl – Episode 7: Leaf 7: Are You a Sniper, by Any Chance? Though not a romance anime series, Wakaba * Girl is an adorable short-form slice-of-life moe comedy about an absurdly rich girl and her attempts to be a “normal” girl. The iconic summer festival fireworks scene in this episode is the perfect setting for her to realize how close she’s become with her new high school friends. Additionally, the animation of the fireworks are absolutely stunning. What Are Your Favorite Anime Fireworks Scenes? Plenty of anime have lovely fireworks scenes! Tell us some of your favorites on Facebook, Twitter, and Tumblr.